Just when you think this Boko haram issue is dying down, you hear another very disturbing story of bombings and planned bombings. Thank God this one was intercepted, only God knows the havoc they would have caused. The Joint Task Force (JTF) on Monday intercepted a suicide bomb-laden car heading for suicide missions in Borno and Yobe states. The driver of the ill-fated car is currently undergoing interrogation. 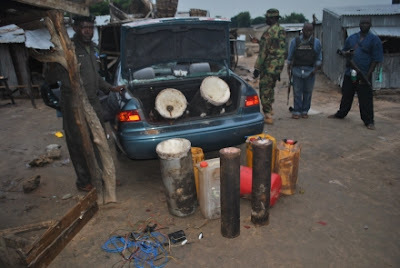 Confirming the arrests in a JTF signed press statement, its spokesman, Lt. Col Sagir Musa said the explosives were meant for suicide bombings in some strategic parts of Borno and Yobe states. “There was an interception of a Camry car with registration no. Borno AA 867 MAF at Tudun Quarters at Mudugumeri Area of Maiduguri at about 6p.m. “The car was loaded with four cylinders; four DAF gas oil cylinders; three constructed Improvised Explosive Devices; 18 by 9 volts battery with two switches and 4 by 25 litres jerricans of incendiary materials earmarked for suicide bombings. “The car was intercepted by a vigilant patrol team which was undergoing routine surveillance following security reports on likely simultaneous suicide bombings in Yobe and Borno states. “All the items recovered are in the custody of the JTF for analysis and further investigation. The driver of the car has been undergoing interrogation in JTF custody.” “Security has been reinforced in the two affected states with more teams on patrol and strategic checkpoints put on red alert.” He said the sponsors of the suicide bomber led by a high profile terrorist commander are under surveillance and would soon be arrested by the JTF.